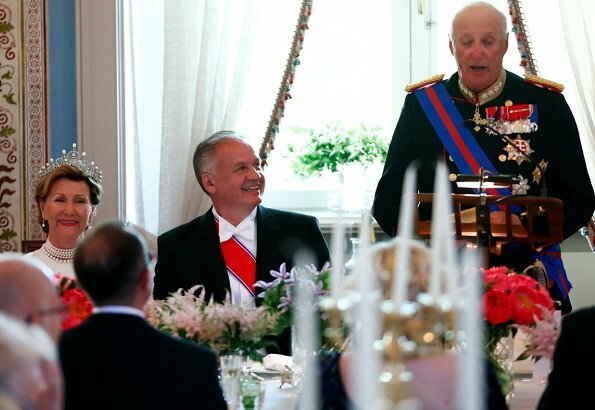 In the evening of June 4, 2018, King Harald V of Norway and Queen Sonja of Norway hosted a Gala Dinner at Oslo Royal Palace in honour of Slovakia's President Andrej Kiska. The gala dinner was attended by Crown Prince Haakon, Crown Princess Mette-Marit and Princess Astrid, Mrs. Ferner. 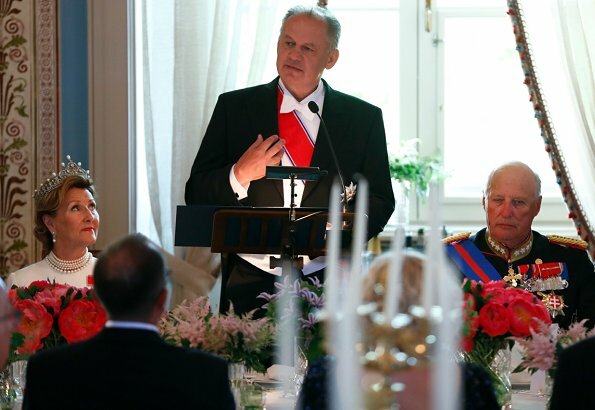 President Andrej Kiska is making a State visit to Norway between the dates of May 4-6 2018. The ladies all look lovely and I am so glad that the Aunt Princess Astrid is usually included. One thing I think would look better at this time of year. Queen Sonia's long sleeves on a white dress would be better as pretty, decorative short sleeves. I like the fancy belt she wears. I am glad to see the royal princess Astrid too. The blue colour of the dress suits her. Funny hair decoration. Collectively, I think all the ladies look nice. It's always nice to see everyone dressed up. But I say this with the most respect that I can, MM needs to loose weight. Almost everything she wears is too small. Not saying she needs to be stick thin, but 20 pounds would make her look so much healthier. Agree. How bright is the summer evening in Norway! 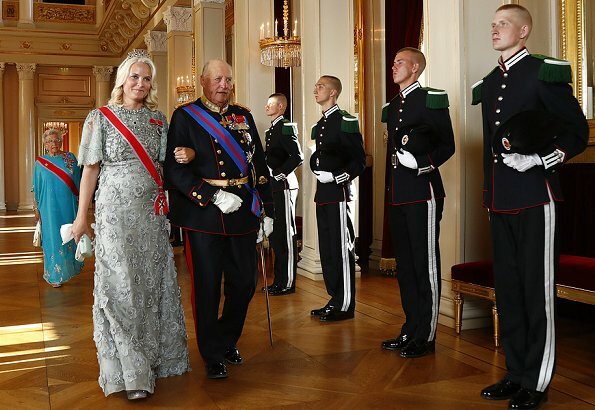 Mette-Marit's dress is a lovely, sparkly silver, just wish it was not so tight in the stomach area. I agree. This time she really looks pregnant. Would have been lovely with a new baby in the Norwegian royal family.She looks beautiful though, with shiny hair and lovely jewellery. She needs new, more supportive undergarments. All three Ladies look very good, sadly MM dress is to tight again maybe a half a size larger and she looks great. Queen Sonja the best dressed. I agree. beautiful and elegant as always. Love the pearls. King Harald loves to make people laugh. 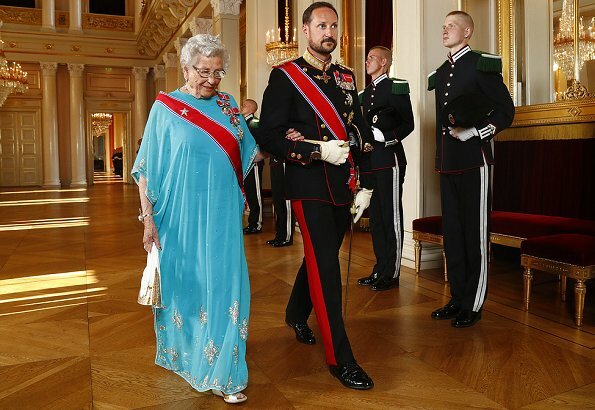 All dresses looks good, but I think Princess Astrid, Mrs Ferner's dress is the most suitable for the State visit at this time of the year. 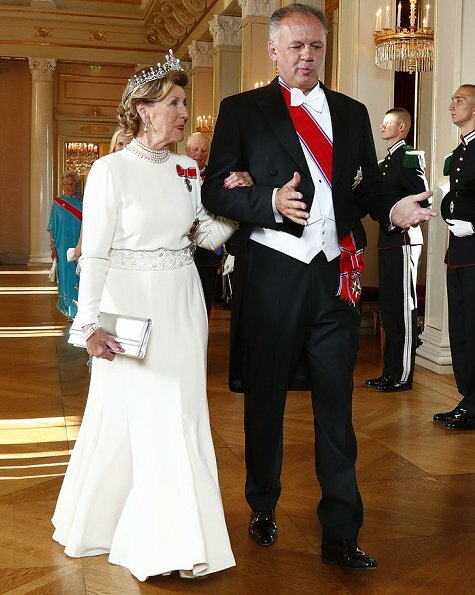 I know, Märtha Louise isn't HRH, but she is still Princess and 4th in the succession to the throne, so strange Princess Astrid but not ML attend this gala dinner, IMO!